Hello, welcome to my blog. 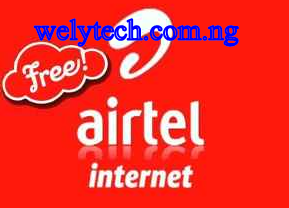 Today I will be showing you how to get Airtel Free Browsing Cheat for 2018 – N0.00 Cheat. This cheat is total free, is a trending cheat for this month. Please note that this Airtel cheat does not work for every Airtel sim. So you can try it, if you are lucky it will work for you. Below are simple steps for you to enjoy the cheat. It is a free cheat and does not cost a dime to enjoy it. Does waste time, try your luck and check if it will work for you. 1. *141*13*200# gives 200MB Airtel free data. 2. *141*13*100# gives 100MB Airtel free data. 3. *141*13*50# gives 50MB free Airtel data. 4. *141*13*1# gives 1MB free Airtel data. Hope it worked, if so you are lucky. if it didn’t stay tuned for more. Airtel Free Browsing Cheat for 2018 use the social media button below to share with friends.